Will racing simulator nuts and cartoony kart-heads come together? Who exactly do developers Bizarre Creations see as the perfect audience for Blur? If you consider yourself a car nerd then most likely you’ll want one of the many, many games which features licensed vehicles to have at least some handling and performance similarities with their real-life counterparts. If you’re a fan of kart games or weapon-based arcade racers then chances are you’re expecting hoverships or balloon-headed monkey drivers. Ideally, hoverships driven by balloon-headed monkeys. Blur has combined Mario Kart and Wipeout’s gameplay with Project Gotham’s eclectic taste in cars and (seeing Land Rovers racing competi-tively with rusted VW Beetles and Nissan 350Zs), and has you firing plasma balls and triggering energy waves. It leaves a peculiar taste. Are we making too much of a snap judgement here? Are we getting all intolerant in our old age? 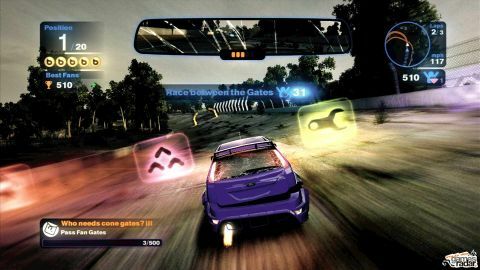 After all, Project Gotham was hardly a simulator and Blur harks back (somewhat unfashionably) to the likes of Need for Speed: Underground and Midnight Club 2 – two titles that embraced reality only lightly. The Midnight Club series especially has long mixed real cars with power-ups and online play. Although Blur will be primarily played as an online title, it also has a substantial single-player component. In this mode, your ultimate aim is to defeat nine rivals, whom you are allowed to compete against in one-on-one races after completing a set amount of races and meeting some of their specific objectives (such as wrecking X amount of cars or landing X number of power-ups). Beat them and you’ll be rewarded with their special ride and a power-up ‘mod’ (such as extra Bolt ammo or a stronger shield) to use in future races. In addition to straight-up races, you’ll also get to take part in beat-the-clock Checkpoint races and a mode called Destruction where you must take down as much traffic as possible using your Bolt attack before the time runs out.